This chapter will seek to interrogate the emerging category of “Bollywood Shakespeare” through a reading of Rituparno Ghosh’s 2007 English language film, The Last Lear. A serious art-house movie, it pays a nostalgic tribute to the traditional Shakespearean stage even as it launches a powerful critique of popular Indian cinema. However, the film also deploys the biggest stars of the mainstream commercial Bombay film industry and their popular appeal. As such, The Last Lear is ambiguously located both within and outside of Bollywood. While its celebration of colonial Shakespearean theater aligns it with older James and Ivory heritage films such as Shakespeare Wallah, which memorialize the Raj through wistful evocations of a dying Shakespearean legacy; the film also flirts with the marketing possibilities opened up by the recent popularity of “Bollywood Shakespeares” represented by gritty Bollywood thrillers based on Shakespearean tragedies, like Vishal Bhardwaj’s Maqbool and Omkara (discussed in the previous section of this volume). These distinct kinds of filmic engagement with Shakespeare are posited on different understandings of the bard’s Indian legacy and the politics of adaptation and appropriation. Further, they suggest different attitudes toward elite and popular, and vernacular and English, and theater and cinematic cultures. 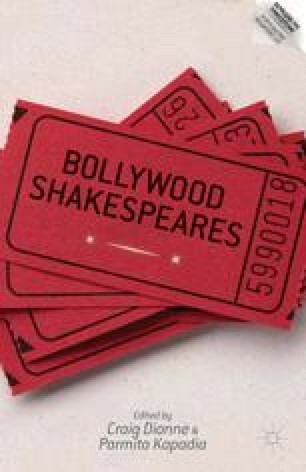 While films like Shakespeare Wallah mourn the decline of the classic purity of the original, Bhardwaj’s films indigenize and assimilate Shakespeare into popular Bollywood idiom. Bradshaw, Peter. Omkara. http://www.guardian.co.uk/film/2006/jul/28/world cinema.bollywood. Accessed on May 20, 2012.